OBJECTIVE To describe the cardiac arrhythmias, electrolyte disturbances, and serum cardiac glycoside levels seen in patients presenting to hospital with acute yellow oleander (Thevetia peruviana) poisoning and to compare these with published reports of digitalis poisoning. SETTING Medical wards of Anuradhapura District General Hospital, Sri Lanka, and coronary care unit of the Institute of Cardiology, National Hospital of Sri Lanka, Colombo, the national tertiary referral centre for cardiology. PATIENTS 351 patients with a history of oleander ingestion. MEASUREMENTS ECG and blood sample analysis on admission. RESULTS Most symptomatic patients had conduction defects affecting the sinus node, the atrioventricular (AV) node, or both. Patients showing cardiac arrhythmias that required transfer for specialised management had significantly higher mean serum cardiac glycoside and potassium but not magnesium concentrations. Although there was considerable overlap between groups, those with conduction defects affecting both sinus and AV nodes had significantly higher mean serum cardiac glycoside levels. CONCLUSIONS Most of these young previously healthy patients had conduction defects affecting the sinus or AV nodes. Relatively few had the atrial or ventricular tachyarrhythmias or ventricular ectopic beats that are typical of digoxin poisoning. Serious yellow oleander induced arrhythmias were associated with higher serum cardiac glycoside concentrations and hyperkalaemia but not with disturbances of magnesium. The yellow oleander (Thevetia peruviana) is an ornamental tree of the Apocyanaceae family that is common throughout the tropics and subtropics.1 Its sap contains cardiac glycosides that are toxic to cardiac muscle and the autonomic nervous system.2 Ingestion of its seeds results in a clinical picture similar to that of digoxin overdose.3-5 Severely poisoned patients may die in dc shock resistant ventricular fibrillation. Many patients with moderate poisoning show PR interval prolongation and progression to atrioventricular (AV) dissociation. We have been carrying out studies over the last three years in an attempt to improve the management of this poisoning. At the same time, it has been possible to record the electrocardiographic and biochemical features of this condition and to compare them with published descriptions of digitalis overdose. Patients were seen on admission to the medical wards of Anuradhapura General Hospital during June to September 1995 and December to March 1997, and to the coronary care unit (CCU) of the Institute of Cardiology, Colombo, during March to October 1997. Anuradhapura General Hospital is the primary health centre for the town and a wide area surrounding it. It is also the secondary hospital for the 750 000 people who live in Anuradhapura District, receiving all oleander poisoned patients who present to rural clinics and small hospitals across the district. The CCU in Colombo is the tertiary cardiology centre with facilities for temporary pacing for the whole island. In Anuradhapura, an ECG was taken during the standard work up of each patient or, when no ECG machine was available, the cardiac rhythm was recorded from a three lead monitor. Patients were seen in Colombo as part of a trial of polyclonal antidigoxin Fab in oleander poisoning (Eddleston Met al, submitted for publication). Every patient admitted to the CCU with oleander poisoning was seen by one of the study team and an ECG recorded. Patients with second or third degree AV block, sinus bradycardia < 40 beats/min, sinus arrest or exit block, or atrial tachyarrhythmias were considered to be severely poisoned and recruited to the study. A blood sample was taken on admission from each patient in Anuradhapura and from Colombo patients recruited to the randomised controlled trial. All samples were centrifuged within 60 minutes; the serum was taken off and stored at −20°C. Samples were transferred on dry ice and thawed only once, immediately before analysis. A biochemical screen was performed in the clinical laboratory of Homerton Hospital, London, using standard automated techniques. Digoxin cross reactive serum cardiac glycosides were measured using a polarisation fluoroimmunoassay for digoxin (Innofluor-Digoxin Assay system, Oxis International Inc, Portland, Oregon, USA on the Abbot TDx machine). ECGs and blood samples were taken from 118 patients presenting to Anuradhapura General Hospital with a history of yellow oleander seed ingestion. Patients were young (mean age 23.9 years); 57% were female. Almost all had previously been in good health; only one reported taking regular drug treatment, a 17 year old girl with rheumatic heart disease on 0.25 mg digoxin/day. A normal ECG was found on presentation in 43%. Many of the other patients showed conduction abnormalities of the sinus node or AV node (table 1). Some patients had been transferred to Anuradhapura on isoprenaline drips and were tachycardic on admission. The Anuradhapura physicians transferred all patients with second or third degree AV block, marked sinus bradycardia, or atrial tachyarrhythmias to the CCU in Colombo. Potassium levels were not measured before transfer; all decisions were based only on the heart rhythm. Mean serum digoxin cross reactive cardiac glycoside and potassium concentrations (table 2) were significantly higher in patients who were transferred: 3.00 nmol/l cardiac glycoside v1.49 nmol/l, and 5.4 mmol/l potassium v 4.3 mmol/l (both p < 0.0001; Student's ttest). Mean serum magnesium concentrations were not different between the two groups: 0.83 mmol/l v 0.82 mmol/l (p = 0.64). However, there was a large degree of overlap between the groups for all three assays (fig 1). Serum concentrations of cardiac glycosides, potassium, and magnesium in patients admitted to Anuradhapura General Hospital who were then either transferred to Colombo or discharged without specific treatment. There was a great deal of overlap between the two groups, particularly with potassium and magnesium, which suggests that neither of these electrolytes will be good early markers of toxicity. The patient with a potassium of 10.8 mmol/l was rapidly transferred but died en route to Colombo. A biochemical screen was performed in a subset of 53 patients (the last 53 seen during the summer of 1995). Creatine kinase (CK) was raised in 14 patients (range 203 to 1124 IU/l); however, this was not related to the severity of cardiotoxicity (CK 201.3 IU/l in patients who were transferred or died v 202.8 IU/l in patients who were discharged without specialised treatment). Liver enzymes were normal in 49 patients; three had mildly increased values while one had a γ glutamyl transferase value of 1112 IU/l and an aspartate transaminase of 101 IU/l. Creatinine and urea were raised in one patient (a 70 year old man); urea alone was raised in three patients. Random blood glucose was greater than 11 mmol/l in six patients (range 11.2 to 38.3 mmol/l). Serum proteins were within the normal range in all 53 patients. Two patients died and 52 required transfer to the Colombo CCU. At least one died during transit. The other 64 patients were treated symptomatically and discharged well. Four other patients died on arrival before either blood sample or ECG could be taken and are not discussed further here. Serum samples were taken from two of the patients who died in hospital and from the patient who died en route to Colombo. Two of them showed marked electrolyte disturbances. KD019 was a 16 year old girl who, on presentation five hours after eating eight seeds, had third degree heart block and a cardiac glycoside concentration of 22 nmol/l, serum potassium of 8.3 mmol/l, and serum magnesium of 1.34 mmol/l. KD025 was a man who presented three hours after eating five seeds with sinus and AV node conduction defects and cardiac glycoside concentration of 5.91 nmol/l, serum potassium of 10.8 mmol/l, and serum magnesium of 1.05 mmol/l. He died en route to Colombo. KD046 was a seventeen year old boy who presented, eight hours after eating two seeds, with second degree AV node block, cardiac glycoside concentration of 4.93 nmol/l, serum potassium of 5.9 mmol/l, and serum magnesium of 0.84 mmol/l. Two hundred and thirty three patients with a history of yellow oleander poisoning were seen in the Colombo CCU after transfer from secondary hospitals in the north of the island. Most patients were young (mean age 24.6 years, range 10 to 67) and previously fit. Fifty nine per cent of the patients were female. A past medical history was taken from the trial patients: one 16 year old boy had a diagnosis of asthma but was not receiving treatment; all other patients had been well previously. The cardiac rhythms of these patients on admission are given in table1. Although most patients had shown typical arrhythmias in the peripheral hospitals, 40% had reverted back to regular sinus rhythm by the time they arrived in the CCU. Relatively few patients showed marked cardiotoxicity on admission, but some progressed from normal ECGs to AV conduction blocks or sick sinus syndrome over the following hours, possibly owing to continuing absorption of cardiac glycosides from the gastrointestinal tract. The 89 patients recruited to the trial had relatively severe cardiotoxicity. The most common arrhythmias were conduction defects affecting the sinus node (sinus bradycardia in 25%; sinus arrest or exit block in 62%) or the AV node (second or third degree heart block in 53%). Thirty per cent of patients had marked involvement of both sinus and AV nodes (table 3). Electrolyte and serum cardiac glycoside concentrations were measured in 88 of these patients (blood samples could not be taken from one patient who died). The mean values for digoxin cross reactive cardiac glycosides, potassium, and magnesium are given in table 2. To investigate the relation between serum cardiac glycoside levels, electrolyte concentrations, and cardiac rhythm, 50 patients seen in Anuradhapura with normal ECGs were compared with 63 patients with marked arrhythmias who were treated in Colombo. Serum cardiac glycoside concentrations were plotted against serum potassium (fig 2A) and magnesium (fig 2B) for the members of each group. Relation of serum potassium and magnesium concentrations to serum cardiac glycoside concentration in the serum of patients with normal ECGs or relatively severe cardiotoxicity. There was a clear relation between serum cardiac glycosides and potassium concentrations. There was an overall correlation ofr = 0.70 between cardiac glycoside and potassium for all 113 patients; analysing the patients with normal rhythms and those with abnormal rhythms separately gave values ofr = 0.68 andr = 0.79, respectively (no significant difference between these values). There was no correlation between serum magnesium and cardiac glycosides for all the patients taken together or for the two groups. The patients with marked arrhythmias were then grouped according to whether the arrhythmia affected the AV node (20 patients), sinus node (25 patients), or both AV and sinus nodes (18 patients). The mean serum cardiac glycoside, potassium, and magnesium concentrations were then calculated (table 4). 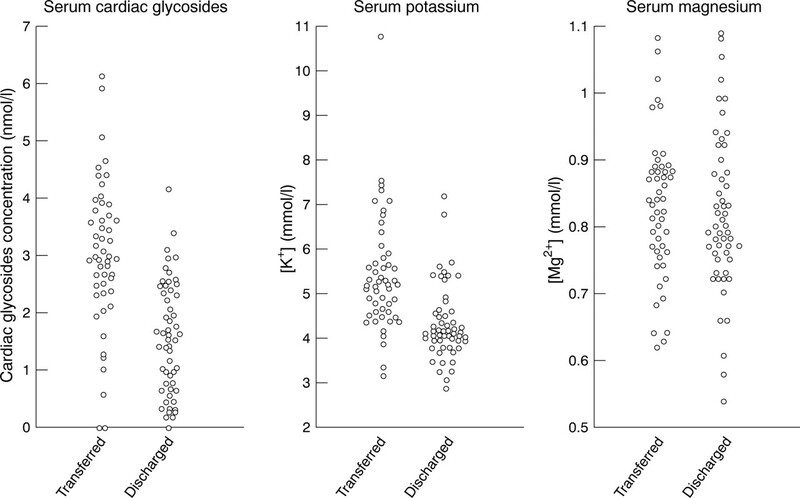 Serum cardiac glycoside levels were plotted against serum potassium (fig 3A) and magnesium (fig 3B) concentrations for the members of these groups. There was no apparent relation between the site of conduction block and the serum cardiac glycoside or electrolyte values. However, the mean serum cardiac glycoside concentration was significantly higher in patients with both AV and sinus node block than in patients with block affecting only the sinus node (p = 0.016; analysis of variance). Relation between serum cardiac glycoside concentration and (A) potassium concentration and (B) magnesium concentration in relation to cardiac abnormality on presentation to Colombo coronary care unit. This epidemic of yellow oleander poisoning in northern Sri Lanka has provided an opportunity to study in detail an uncommon poisoning that occurs in many parts of the tropical world. All but one of the previous reports had presented fewer than 13 cases2; one report of 170 cases included no ECG or biochemical data.4The present study of 351 patients is the first to provide this information. Most symptomatic patients had conduction defects affecting the sinus or AV node; in 30% of the severe cases both nodes were significantly affected (table 2). Both AV conduction block and sinus dysfunction were overrepresented in these patients owing to selection bias compared with previous series of digoxin poisoning. However, the unreliability of the lists of digoxin associated arrhythmias has been emphasised by Fisch and Stone.12 They noted the lack of control groups, their retrospective nature, the variation in the physicians' ability to distinguish particular arrhythmias, and the difficulty of distinguishing digoxin related arrhythmias from those caused by the underlying defect requiring the digoxin treatment. The prospective nature of the current study, together with health of its subjects, reduces the force of these criticisms. Rhythms characteristic of Mobitz type II AV conduction block, although reported to be rare in isolated digoxin poisoning,15occurred in several of the oleander patients (see fig 3 in reference9). Atrial fibrillation and flutter were uncommon in our patients, again probably because of their good pre-existing cardiac status. The four patients in our series with these arrhythmias all presented with a slow ventricular response owing to impaired AV conduction, as occurs in digoxin poisoning.5 15 The patients treated with antidigoxin Fab reverted back to normal sinus rhythm (Eddleston Met al, unpublished data, 1999), suggesting that these atrial arrhythmias had not been present before the poisoning. Ventricular ectopic beats were uncommon in the oleander patients. Hyperkalaemia exacerbates cardiac glycoside induced cardiac arrhythmias and is a marker of a poor outcome in cardiac glycoside poisoning. Even though all symptomatic patients had persistent vomiting, severe yellow oleander induced cardiotoxicity was associated with hyperkalaemia. The degree of hyperkalaemia correlated with the serum digoxin cross reactive cardiac glycoside concentration (fig 2). Serum cardiac glycoside and potassium concentrations were significantly higher in patients transferred to Colombo for specialised care than in those discharged directly from Anuradhapura. Unfortunately, we did not find serum potassium to be a specific early marker of patients who would require transfer (fig 1). Ten of 54 patients who were managed symptomatically in Anuradhapura without transfer had serum potassium values > 5.0 mmol/l on admission. The potassium and cardiac glycoside levels were not higher in patients recruited to the trial than in those who required transfer from Anuradhapura to the CCU. This may be because patients with markedly raised potassium or cardiac glycosides died before reaching Colombo. Accidental digoxin poisoning in elderly patients taking therapeutic digoxin is often complicated by hypokalaemia owing to combined treatment with diuretics.13 15 This is an uncommon problem in both yellow oleander poisoning and suicidal digoxin overdose.11 16 However, three patients who presented to Colombo with severe poisoning had serum potassium concentrations less than 3.0 mmol/l; one of these patients died (Eddleston Met al, unpublished data, 1999). Further studies will be required to see whether early potassium assay and correction improves outcome. Hypomagnesaemia predisposes to digoxin toxicity.13 15 We found no relation between serum magnesium with either arrhythmia or cardiac glycoside concentration. This suggests that serum magnesium concentrations are not altered by yellow oleander poisoning but does not preclude the possibility that abnormally high or low magnesium levels before the poisoning might affect the outcome. Two of the three fatalities from whom we were able to get blood samples had hypermagnesaemia (1.08 and 1.34 mmol/l). One patient who was treated in the clinical trial but died had a serum magnesium concentration of 0.47 mmol/l. We were unable to identify a clear relation between a patient's arrhythmia at presentation and the serum glycoside concentration or electrolyte disturbance. Future studies will need to assess the relative importance of cardiac glycoside levels and electrolyte disturbances at presentation as determinants of mortality. We thank the staff of Anuradhapura General Hospital and Institute of Cardiology for the help during the course of these studies, and Douglas Chamberlain for his comments on the manuscript. The work was supported by the Association of Physicians (Links with Developing Countries) and Therapeutic Antibodies Ltd.
(1989) Oleander poisoning. in Toxic plants and animals: a guide for Australia, eds Covacevich J, Davine P, Pearn J (William Brooks, Brisbane), 2nd ed. pp 37–50. (1996) Oleander toxicity: an examination of the human and animal toxic exposures. Toxicology 109:1–13. (1985) Yellow oleander poisoning—clinical manifestations and prognostic criteria. Jaffna Med J 20:100–101. (1988) Yellow oleander poisoning—a study of 170 cases. Forensic Sci Int 36:247–250. , eds (1969) Digitalis. (Grune and Stratton, New York). (1979) Oleander poisoning. Med J Aust 2:267–269. (1986) Herbal poisoning: a case report of a fatal yellow oleander poisoning from the Solomon islands. Ann Trop Paediatr 6:289–291. (1985) Oleander tea: herbal draught of death. Ann Emerg Med 14:350–353. (1999) Epidemic of self-poisoning with seeds of the yellow oleander tree (Thevetia peruviana) in northern Sri Lanka. Trop Med Int Health 4:266–273. (1998) Deliberate self-harm in Sri Lanka: an overlooked tragedy in the developing world. BMJ 317:133–135. (1968) Intoxication digitalique aigue (70 observations). Bull Soc Med Hop Paris 119:247–274. (1969) Recognition and treatment of digitalis toxicity. in Digitalis. eds Fisch C, Surawicz B (Grune and Stratton, New York). (1984) Digitalis glycosides: mechanisms and manifestations of toxicity (parts I−III). Prog Cardiovasc Dis 26:413–458, , 495–540; 27:21–56..
(1992) Recognition and management of digitalis toxicity. Am J Cardiol 69:108–19G. (1973) Hyperkalaemia in acute digitalis poisoning: prognostic significance and therapeutic implications. Clin Toxicol 6:153–162.